This is my 7th year to do Christmas Ornament Countdowns on the blog. I must truly have way too much time on my hands. Most people probably do not have their Christmas ornaments photographed and blogged about along with a spreadsheet of each of the ornaments. We have 238 travel ornaments that we have collected in our 17 years. Our first true ornament came when we were in Disney World for our honeymoon. It became a tradition when bought our next ornament on our 1 year anniversary trip in Philadelphia. The original plan was for us to travel to a new state each year on our anniversary. Somehow, we got ahead of ourselves and finished early and somehow, we ended up with many more than one ornament per state. After this years ornament posts, I will just have 11 ornaments that I have not blogged about. I guess that means that we need to travel to a lot of places this next year so I can buy at least 13 new ornaments to complete the countdown next year. That seems doable since I did buy exactly 11 ornaments this year. Washington D.C. is one of Robby's absolute favorite places. So much so that we have been there on 6 different trips. 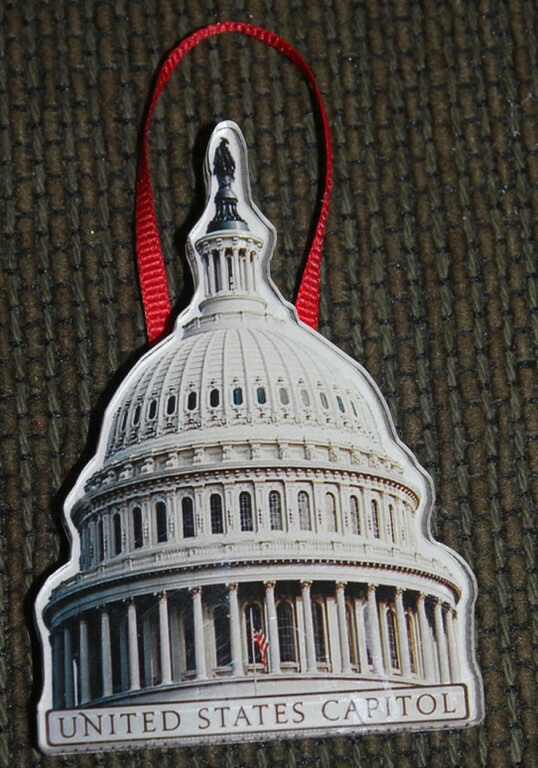 Of the many landmarks in D.C., the one that I always enjoy seeing is the U.S. Capitol building and today's showcase ornament. I think that on at least one of our trips there, the Capitol has been under construction with dome covered in scaffolding. We have toured the Capitol building twice-once before the massive security and once afterwards. Even with tons of security, it is still an awe-inspiring place and I feel very fortunate that our Capitol is a mini replica of it. Graham was the only one awake this morning. Everyone else but him and Whitman were still in their beds at 7:30. Whitman was sleeping soundly in our bed. He didn't join us until 4:30. When he did he told me that his tent had fallen off of his bed. That sounded legit and all but I was a bit worried that he had gotten sick again (I had given him his antibiotic after his large supper.) I sniffed him a few times and he didn't smell sickly. I tried to form to the words to ask but wasn't able to do that before falling back asleep. When we did finally stir, I worked and worked trying to get Whitman to wake up. That boy was tired this morning. I unloaded clothes from the dryer, emptied the dishwasher, made my bed with the sleeping boy in it all while working hard at waking him up. Finally, I was able to stir him enough for him to put on his clothes and go to the bathroom. It did help that I offered him a juice box to drink for breakfast. Today was "J" day at school and we needed a J something to take and his juice box fit the bill. After Whitman left for school, we started our school here. We did our work together first. I know that i have said it before but it is my favorite part of the day and I do think that the kids secretly love this bit of downtime during school. We don't have school tomorrow so we had lots of loose ends to tie up. Reagan was working hard to finish two deadlines today-a 6 stanza poem about a family member along with a brochure about a book she just read. Meanwhile, her brother spent time laying around the school room or just wandering around instead of getting right to his work. Whitman has been waiting to spend the night at Nonna and Pops' house for a long while. Chuck E Cheese was calling his name, and he could not wait to get there. Pops and Nonna picked him up and they were off. He had fun playing there, but he also enjoyed his tiny pancakes for supper. The rest of us spent our afternoon around the house. Campbell, Keaton and I made chocolate chip pumpkin muffins, fudge and chocolate crinkle cookies. After that, I went up to the treadmill but before I did that, I kicked everyone else who was in the house (except for Robby) outside. There the kids stayed until 9! Yes, 9:00. I guess 5 hours outside is a very long time-I did the treadmill, worked on my ornament blog, made supper (Chicken Ranch Pasta-delicious), planned Anderson's birthday party, and read all of the internet. When the kids did come in (we called them in), they ate supper and then were sent to the showers before being quickly herded to bed. The boys were excited about Whitman not being there-they said that he does a lot of talking to his bear before he falls asleep. I assured them that if they were scared tonight without Whitman, they could come down to our room. After missing last week at Bible study because of Thanksgiving and staying up a bit later than usual lately, I was surprised that the kids woke up well and for the most part got themselves ready. After yelling up the stairs many times to the bonus room, I assumed that all of my people had brushed, put on their clothes and packed their lunch. I was wrong; when we made it to the park, Graham quickly discovered that he did not have a lunch. I did have plenty of spare lunch items but hopefully, next time he will remember to listen when I tell him to do something. CBS was good this morning and they are decorating the halls for Christmas. They go all out up there and it is just pretty amazing. Afterwards, we all headed to the park to play for a bit. The kids quickly noticed that the tornado sirens went off twice for their Wednesday practice. For some reason, the sirens went off earlier than they were supposed to and then again at noon. After we had played a good long while, we headed to Dairy Queen for our weekly Blizzards. I had three kids this time order a M&M Blizzards with the M&Ms on the side. Everyone ate their snacks and then we were off to church. Robby was at a funeral this afternoon and snuck our early to take Reagan to the orthodontist to get her braces tightened. I am sure that it must hurt because she tried to eat pretzels for a snack but said that it hurt too much. Whitman went with them and I took the rest of the crew home. I was there for a bit and about the time that Robby headed home, I left for a focus group at Tacos for Life. The experience was fun but the taco was not my favorite at all. When I made it home, I brushed my teeth twice and even looked for a Tums! I let Campbell and her helpers make brownies for Friday night and then it was time for me to throw hot dogs on the grill for our supper. We scarfed down our food, and then we loaded the car. I ran to the library and since it is food for fines time, my almost 10 dollar fine went down to zero since I brought 10 cans of food! Sweet! Next was church time and the kids were going to the indoor playground tonight instead of playing games. That was fine with me so I headed down to the preteens and went to their service. I was able to see Reagan leading in worship which was pretty neat. Anderson was in that area too and I did watch him like a hawk since the boy section was pretty noisy and full of movement. Once we made it home, the kids changed and had a few minutes of downtime before bed. Then it was time to head upstairs for teeth brushing and bed. We have moved their toothbrushes to upstairs and this week the boys won the contest of who could keep the cleanest sink. Whitman climbed into our bed last night which isn't very unusual. We woke on up this morning and I headed upstairs to turn off the fans and to wake the girls up. When I walked into the boys room, I immediately saw vomit in the floor right near Graham's bed. I headed back down and asked Graham if he had gotten sick last night. He went upstairs to see the evidence. Meanwhile, I figured that vomit that was hours old could wait a bit so I started helping Whitman get dressed for the day. I asked him if he had spit last night and he immediately said, "I opened my mouth and it just came out. Three times." He went on to tell me all about it. He even apologized. I tried to explain that it was okay and to always just tell Mommy whenever it happened. Graham then came into the room and said that maybe he did get sick last night. He told me that his stomach did hurt last night so it was probably him. That sweet boy had convinced himself that it was him! I went on back upstairs with all of my supplies and discovered for sure that it was indeed Whitman since there was more evidence in his bed. I went to work washing sheets and scrubbing carpets. At least I giggled the entire time about Graham being convinced that it was him! Whitman seemed to feel just fine so off he went to school. I would bet that his upset stomach was just due to his antibiotic that he is taking. I did give it to him before supper and not after. He didn't get any today but we still have to continue to make sure that ear is better. Once he left, the rest of us started on school. Keaton has 11 lessons left on her reading book which is huge. My goal is to finish that before Christmas. All of the kids are halfway in their spelling books already and Campbell and Graham have a book that we are going to try to at least get to lesson 50 (of 100) before Christmas. We ate our lunch around 12:30 and then the afternoon kicked into high gear. Chores were finished, school was completed, treadmill time was served. The kids were in and out but spent quite a bit of time playing with blocks and driving remote control cars. We left around 4 and ran to April's house and then met Robby at Chick Fil A. Then I scooted off to Bunko while Robby chauffeured the three basketball kiddos to practice. The first games are Saturday. Robby then brought everyone home and after everyone had showered, they helped Brett do a science experiment. The kids went to bed later than usual so I know they will be tired tomorrow. It is sure hard in the mornings when I have to walk up the stairs to wake up everyone. It does rarely happen but gracious me, if Whitman didn't have to go to preschool, we might have all just slept in this morning. After Whitman left, the kids found their cereal and I read and read and read. We were a bit behind, from last week, on all of our read aloud work so we used this quiet morning to catch ourselves up. Then everyone started on their school work. The little girls were pretty needy today getting back in the swing of things, and I do believe that Anderson plays a game to just see how slowly he can finish his school work. I think that this bothers me so because I was the complete opposite-do it fast and turn it in even if there is mistakes. Anderson, however, is do it slow with no mistakes at all. The boy only missed 2 or 3 math problems today-he is the epitome of slow and steady wins the race. It was 12:30 when we finally ate our lunch. The kids are still in to making their sandwiches into paninis. Keaton still loves the toaster oven so when we finish lunch, we have lots of appliances to put back in the cabinets. Next up was chores and there seemed to be lots of them to do today. Now, from about 1 until 3, I have no idea where the time went. I did manage to mark a lot of things off of my list today but I was shocked when I looked up noticed that it was already 3. Pops and Nonna brought home Whitman and he was so excited to show them his Christmas tree. By this time, the boys were outside with their remote control cars. Everyone soon went outside and the neighbors eventually came out. I walked on the treadmill for a bit and then helped Robby some afterwards. He put lights on the wooden Christmas trees that Tony had made for us last year. It was cold outside so I didn't last too long but the kids were outside until almost 8. They had supper and showers when they came in. Then there was a bit of downtime before bed. No one turned on their Christmas trees tonight since those bright lights just seem to cause a commotion. Anderson and Graham were up this morning before everyone else. Anderson didn't put on his church clothes this morning just in case it wasn't Sunday. I am not sure if I blogged about it or not but on Black Friday, Anderson woke up thinking that it was Sunday and put on his church clothes before coming downstairs. Ha! He soon realized it and put his pjs back on. Today he was taking no chances and was one of the last ones dressed. Campbell had already picked our her clothes last night and gracious if there wasn't a hold in her shirt this morning. (Grannymom, it will be coming your way.) Keaton had also picked out her clothes but she opted to change and just tried to wear a jacket and no shirt to church. Thankfully, I did catch that but didn't catch her no socked feet. Reagan is now my easiest girl when it comes to getting dressed on a Sunday morning. We ate and then were out the door for church. We taught Campbell's Sunday school class today. It was interesting-first and second grade. Last year we taught 3rd graders and since they can read and have a general knowledge of how to look something up in the Bible things were much different today. After listening to some of the other kiddos read today, I did leave feeling pretty confident in my Campbell's reading ability. After church, we celebrated Dana's birthday at Grannymom's house. Grannymom had Mexican and we even left with party favors. Dana had painted a nativity and it now looks perfect by my circle chairs. While the kids played, Robby and I ran to the grocery store. We came home with a haul of Pop Tarts that were on sale today. It was a big sale and my pantry is beginning to look like a warehouse since we have been doing more couponing lately. If something were to happen, you can come here and we can survive on pop tarts, muffing mix, cereal and chocolate chips. Back at home this afternoon, the kids played some while Robby, Campbell and Keaton ran to pick up supper and buy some more Pops Tarts. The evening was pretty calm around here-calm and noisy. The boys did dig out some old remote control cars and spent quite a bit of time playing with them. I played a game with the girls and Graham and as soon as it was over, I looked up and it was bedtime. Each night the tree causes the boys room to be pretty crazy-it is too bright in there for them to go to sleep. Poor Campbell said that she really wants to keep her lights on longer but Keaton and Reagan say that they are too bright. We had a good long conversation about trying to get along with other people! Surprisingly, I woke up at 7 and since Pennys was giving out 10 off of 10 dollar coupons this morning, I hopped in the car and headed there. When I told the boys bye, they were the only ones awake, they wanted to make sure that I was not going anywhere with lots of toys. I assured them that they didn't want to go with me because there would be no toys. I arrived at Pennys early enough to watch people line up. I knew there would be enough coupons (they were still handing them out when I left) but I still got out of my car and stood in the line. I didn't want to miss out on the fun. It took me longer than I wanted to find what I needed but still did check out in time to walk around Walmart for a bit looking for a few little presents. I was able to mark 2 people off of my Christmas list today so that made me pretty happy. Then it was on down the road to Nike to spend a coupon before heading home. I hadn't been home too long when Robby took the girls and Whitman to Grannymom's house for the day. We had a funeral to go to in Prescot so one group headed to Grannymom's house and the big boys went to Pops' house. The kids all had big days. The girls and Whitman baked, decorated Grannymom's house, played outside, took a walk and played with Lilly and Cash. The big boys played with the toys, watched football and even went to see a movie. They all had busy days and were tired when they made it home. We worked on putting the ornaments on their trees. Bless em! Reagan is a perfectionist and had a hard time letting Campbell and Keaton do anything. I know, it's tough being a perfectionist. By the time the trees were over, it was bedtime. They were all pretty wired even though they were tired. We could hear them upstairs for a good long time before it was finally quiet up there. I slept in as long as I could this morning and then jumped out of bed to go and meet Pops at the Bass Pro. I had a list of places that I could go afterwards, but when the boys decided to go with me (I asked if they wanted to come) and when I left one coupon at home, my list of places to visit dwindled to just Bass Pro. I think that Anderson and Graham were a bit disappointed in our Black Friday shopping. We did meet Pops and buy some of his Christmas presents. Jason was there too so he stood in line with us-around 30 minutes. The line did move pretty decently and there was plenty of odd things to look at as we went through the line (all different types of duck decoys). We put up our living room tree and even though it is 21 years old this year, it still looks decent. I didn't put nearly as many ornaments on it because we have the tree in the corner and there is no reason to decorate the backsides. I think that everyone hung up an ornament but Campbell and Keaton stuck with me the longest hanging up ornaments. Robby made lunch for everyone and soon the tree was finished. The Hogs came on-football and basketball and I worked during the games. I was able to finish the snow village and pretty much get most things in their spots, including the new little kitchen tree, before I sat down and snoozed through the 4th quarter. Afterwards, it was just about supper time. We had a snacky supper and afterwards, Campbell and Robby ran to the grocery store. Not too many people were at the store the day after Thanksgiving. While they were gone, the boys helped me put up their tree. Then when Campbell and Robby came home, we put up the girls' tree. The girls' prelit tree has lost its prelit so we added lights to it. I guess it might just be time to spring for new trees for the kids too-the girls tree doesn't light up without more lights and the boys tree is from the side of the road. At least they both still look decent. The kids had some downtime, just a bit, before bed. I think that are enjoying our Thanksgiving break, and I am already a bit worried about starting back to school on Monday! Wonder if we could take another week off? My alarm rang a few times less than usual when I was about to climb out of bed. Whitman came and laid down beside us for a bit before I made it out of the bed. I reminded him about Thanksgiving and ran down the list of who all was coming to our house. He told me that he did NOT want to eat turkey but I do believe that he ate his fair share of rice krispy treat turkeys. Graham and Anderson were already awake when I went upstairs to wake up the girls. It looked like Campbell had just stumbled out of bed but Reagan and Keaton's beds were already made. I made the boys beds along with Campbell's bed and then headed downstairs to do the dishes before my shower. The kids had breakfasts and before we knew it, it was time to start on the first of today's turkeys. The girls made a fruit turkey-usually we make two different fruit turkeys but this year, we changed things up a bit. The girls went to town washing and slicing the fruit. Reagan knew exactly how she wanted it to look and the girls went right to work. It was really cute. After they cleaned up from that, I made the corn casserole (new recipe which Robby said was one of his favorites). Then it was time for the boys to work on their turkey-a meat, cheese and cracker turkey. They were a bit more haphazardly than the girls, but they finished and it looked cute. Whitman tried his best to help. Dana, Cash and Lilly arrived soon and Jason was not too far behind. I pulled out the hummus and cheese ball and we began eating that early in the morning. Soon everyone else had arrived and we played a game before lunch. We played pictionary-adults vs. kids. I was so in to the game that I forgot that I was supposed to be getting everything ready for lunch. Pops and I had to throw the rolls in the oven and scramble putting ice in the glasses while Robby was in the others room blessing the food. The cabinets were filled with food and desserts. Everyone had their fill and before I even sat down to eat, I saw the boys in the back playing football. The kids occupied themselves great all day long (well, all but the little one.) The neighbors and their cousins were over and everyone played outside most of the afternoon. The girls worked on making red and green pom poms to hang up. There was also a pumpkin that I had out for the kids to put rubber bands on. Once there was enough rubber bands on it, the pumpkin would burst open or that was our hope at least. Thankfully, the pumpkin did burst when Lilly, Reagan and Campbell were nearby. We all were outside and heard the pumpkin pop but mainly we heard the girls scream and squeal. There was lots of parade watching, picture taking, football viewing and sales ad browsing throughout the day. There was also a lot of grazing as well. Everyone stayed until supper time and we pulled out all of the food and did it all again. Les, Shelley, Josh, Zach, and Jason stayed the longest. Jason worked a lego car and the kids ended the evening watching the movie Greater while we picked up the kitchen while waiting on them to finish. When the movie was finally over the kids headed to bed. My favorite holiday was again a great one. We hadn't been downstairs too long when there was quite a commotion upstairs in the girls' room. Robby went upstairs to check it all out. I heard the word "bat" and waited very quietly for Robby to call me upstairs. Thankfully, I soon heard him coming down the steps. I had heard wrong, it was not a bat but a bug. This must have been a bit traumatic for the girls because when I went up the stairs after 8 this morning to wake them up, I found all 3 of them in Reagan's bed. They were all sleeping soundly, and I bet that they are in the same bed again tonight. The boys were all up early this morning. The big boys were upstairs on the xbox and Whitman was working hard on his drawings. He was also playing with his pie. He has a toy pie that he received at least 2 Christmas' ago. I guess that I would say that it is his favorite toy since he plays with it every single day. We had our breakfast and did our reading this morning. I do believe that the kids could get used to our light school. After I read as many books as I could, I had a few pages of "pumpkin math" for the kids to do. This delighted everyone and they worked on it for a while. Then it was chore time. By this time, Robby was already cleaning the bathrooms. The kids helped out and quickly checked off their lists. As soon as Robby was finished with the kitchen bathroom, we locked that door and not a soul has been in there. There are way too many kids in this house to keep a clean bathroom for over 24 hours. After we ate a bit of lunch, everyone was shooed outside for some yard work. Robby is able to mow most of the leaves with his mower (which I now believe was worth every single penny), but there are still pockets of leaves that must be raked. We all worked for about 5 hours. Before we went outside, Robby said that if we could get an hours work from the kids then we would be doing good. We had no idea that they would work for 5 hours. They raked and they hauled tarp full after tarp full of leaves down the hill to the woods. The pile that the kids raked yesterday to jump in took at least 12 tarp loads to finish that one pile. We did have one good break and ate over a package of cookies, but other than that the kids worked the entire time. Now, they did their share of complaining and sitting around waiting on me to tell them what to do. But for the most part, they did great. Once we had been given the "all done" the kids went down to play with the neighbors and I went in for a shower. I was filthy but after Robby mows, he is just disgusting. His grey coat turns brown along with every part of him. There was just dust everywhere so much so that Robby made Anderson wear a mask while pushing the lawnmower. By 6:30, I had called everyone in (Anderson's throat hurt so he came in earlier and Keaton was cold so she was already inside.) They showered and then we ate frozen pizza for supper. Afterwards, we worked on a snickerdoodle bar for tomorrow and then made rice krispy treat turkeys. It was a day full of hard work and I think that everyone was pretty tired. At least Robby and I were. We debated not mopping the floors and vacuuming after the kids went to bed but we did. And I think that I am glad that we did...I'll feel better after I have some of apple cider. Whitman didn't come into our room this morning but we could hear him right outside our door coloring. Well, at least I was hoping that he was coloring on paper. Thankfully, he was coloring on paper and soon came in to show me. He had made 4 flowers-one being a "snapping dragon flower." Everyone but Keaton was already awake this morning-even Reagan. She never is an early riser when we are doing school, but since our school the last few mornings has only consisted of reading a 8 or so books and doing a few other fun things, she is up as soon as the boys. We had our breakfast and then did our bit of school. Today's chores were the windows, dusting and even cleaning some baseboards. Keaton and Campbell love anything to do with water and a scrub brush. The kids went outside a bit before lunch, but did come in for some more reading and lunch. Pretty soon after lunch, everyone went outside and for the most part they stayed there all day long. Sometime this afternoon, Cash came over to play. The kids were so excited. They mostly played outside but did come in a bit while I ran to the library with Whitman to pick up a few books. Once I made it home, the kids migrated back outside. They raked up a pile of leaves almost as tall as me. Then there was much jumping in and riding through the leaves on their bikes. They were filthy-so filthy that I should have made them come in for showers but I just let them ride on down to the neighbors instead. They were all outside until almost 8 when we called them in for pancakes. Pancakes are a lot of work (especially for Robby) but I think that I could eat them every week. Afterwards, the girls started on their showers while the boys played. Whitman did sleep all night long but was right by the side of my bed at 7. I think that he might have gone back to sleep for a bit. He said that his ear didn't hurt this morning but once we made it to church, he started complaining again. When we finished eating, we did get started on cracking my pecans. I had waited until I could use Nonna's crackers since I don't have any of my own. The kids were anxious to help and everyone did have a turn or two. Campbell stuck with me til the end. We made a huge mess on the floor of pecan shells but Jason helped me clean up, and I came away with about a quart of pecans. They aren't the best or the prettiest but will do for how little I use them. Then we came home for our afternoon naps. Well, Robby and my afternoon naps. I do believe that the kids came in and out of our bedroom about 21 times during our nap but it was still a wonderful nap. Wonderful. When we finally did wake up, I went to work on making everyone pick up. Robby moved our tv cabinet back into the living room. It looks pretty okay. We haven't put the tv back on it but I do think that it will look better. Now, only if we could paint the couch and make it look better. Robby worked on supper-hamburgers. He was able to feed everyone a hamburger even though he only had 4. I am not sure how that happened though he did have to supplement with some of his frozen lasagna. I went with leftover potato soup while I worked on supper for tomorrow night. After we cleaned the kitchen, Campbell helped me make my first draft of my grocery list. Robby ran to the Wilson's house and was soon home. I went upstairs to work on one project while the kids watched a show. I joined them for the finale of the Toy Box. We were disappointed in the toy that won but were pleased that it was then bedtime! Everyone slept all night last night and I wasn't in much hurry to get up, even though I should have been eager to finish the last day of school before our "Thanksgiving Break." I used quotations there because we will still be doing some school-history, science and a few other things. I can still call in a break though because there will be no math or analytical grammar (which I am starting to dread as much as Reagan and Anderson). Campbell poured Whitman some cereal pretty early this morning, but he did sit at the bar with everyone else so he could listen to this morning's books. I have about 30 library books that I want to read and turn in before Thanksgiving. They are mostly picture books though they all seem to be very wordy picture books. Then we can start on the slew of Christmas books that I already have checked out. The kids worked on school and we were all pretty much finished by 12. We had just sat down to lunch when Grannymom and Grandpa stopped by. They were there to pick up Reagan who spent the night at their house tonight. After they left, the rest of us finished lunch and worked on their chores. The kids were anxious to go outside but no one wanted to go outside alone. Campbell and Graham would come to me and ask me to make everyone go outside. I tried to convince them to go outside themselves and everyone else would follow and eventually that did happen. This afternoon Tony did deliver 2 Christmas presents. He spent most of the morning making them, and I seriously can not wait to finish them out. The little girls will love them but Reagan will not be happy at all about them! I did a few things around the house this afternoon and pretty much as soon as Robby could leave after 5, we jumped in the car with Whitman and headed to the grocery store. My list was short, Robby's list was short but it still took us over an hour. It was wonderful. Now, we didn't buy anything that we need for Thanksgiving so we still get to come back soon. The kids spent most of the afternoon and until 7ish playing with the neighbors. Greyson did come over to spent the night with us. We didn't really see the boys until we called them down for supper-pancakes made by Robby, Keaton and Campbell. Then they watched a movie while I did the first coat of paint on my tv stand. So far, I am not too crazy about my paint color but maybe it will grow on me when I get another coat on it. Fingers crossed! The kids didn't go to bed until nearly 11 which made for a very short night for us. Last night before I went to sleep, I was reading a chapter of a book which talked about how interruptions in our life are not surprises to God and are our chances to fulfill his plan with grace and excellence. I laid down thinking about how great that was...but at 2 in the morning when Reagan came to get me, all I could think about was maybe that chapter wasn't so good after all. I wasn't pleased with any interruptions! It was my Keaton. She was sick upstairs. I made it before she threw up but gracious when she did. She made it into the potty but we both just got completely splattered. I had never had that happen to me. I found myself rinsing off in the sink after she was done. I brought her downstairs and made her a pallet. Within an hour, she was asleep so I soon was sleeping too. Thankfully, she slept all night and was ready to get her waffles when it was breakfast time. Whitman had spent the night with Grannymom and Grandpa, and they took him to school this morning. It was Grandparent day. Whitman's class sang a few songs and ate muffins with their grandparents. Afterwards, Whitman showed all of his grands around his classroom. He even told me about it when he came home. After breakfast, everyone here stared on school. Things went well and soon it was almost lunch time. Robby ran to lunch with the 3 littles and after offering lunch to the 3 bigs, I left to go to Nonna and Pops' house. We went to a few stores and ended up buying most of their Christmas presents. It was a lot of fun spending someone else's money. While I was gone, Anderson finished his school work and the others played xbox for a while. Before I made it home, the kids all migrated outside with the neighbors and stayed there until after 7. I made some cornbread and then ran to Lowes for a bit. It was crazy empty in there so if you need to shop at Lowes, go at night. After picking up my goodies, I ran home to eat. I hadn't eaten breakfast or lunch so I was starving. I had eaten my weight in cookies but that didn't seem to keep me full! The kids showered and ate their supper while I ran to the Wilsons. After a while, it was bedtime for the crew. After spending most of the afternoon and all evening outside, they were pretty tired tonight. It wasn't too much different than usual this morning waking up with two of the kiddos elsewhere. The boys were still up before anyone else-already dressed and playing Minecraft. Campbell and Caroline were also dressed and eating breakfast. Whitman had no thoughts of getting dressed but was having a blast watching the girls play something on their ipads. Soon everyone was in the car waiting on me. What was I doing? Standing in a chair fanning the smoke alarm. My bagel didn't pop out of the toaster oven so it was a bit extra toasty. I am afraid that my 17 year old toaster is getting a bit slow to pop things out. I never really leave it unattended and always unplug it but that was my last bagel so there was no redoing in this morning. It was still kind of yummy though-burnt sides and all. We made it to Bible study just a bit early which was fine because today was bring your Christmas shoebox day and kid performance day. I am not really sure why they did their performance before Thanksgiving so it wasn't really Christmassy but it was still cute. Anderson, Graham and Campbell's group said Psalm 100. They did very good but we couldn't even see Anderson since he was standing almost behind his brother. Next up was Keaton and Whitman. They did great though Whitman sang only a little-I do consider not laying on the stage successful. And Reagan is too old to do anything. She did help with the little kids and stood behind them which I am very glad that she did get to help. My kids are pretty fortunate to have such a large cheering section. Grannymom, Grandpa, Nonna, Pops, Jason were all there cheering them on along with Robby and me. After the performance, we picked up pizza and headed home. It was raining and all of our other friends were skipping out on the park. Most everyone decided to eat their pizza in the car. I guess we were all starving. Once we did make it home, we all did empty the car and then meet at the bar to eat some of Campbell and Graham's snack (chocolate chip cookie cake and snickerdoodles). I was super productive this afternoon which was pretty strange for a Wednesday. I helped Anderson and Graham rebuild two broken lego sets, rearranged the girls' room, worked some in the attic, took some toys out of the boys' room and rearranged my tupperware. I possibly should skip the park every single Wednesday. It was soon church time and we headed to Sonic for 50 cent grilled cheese. The kids ate those in the car while I ran in to the library. At church tonight, Campbell and Graham's group helped pack shoeboxes for Operation Christmas child. Anderson and Reagan's group helped the younger kids pack the boxes (they worked a table, walked with the little kids, taped up things). And Keaton and Whitman's group colored pictures to go inside of the boxes. Everyone had a great time. Once at home, we changed into pjs and had one last cookie before bed! Robby had told the boys that they would need to start right on their school work this morning and not get their ipads. Since this was a shorter morning, I only had given them about 5 things to do but man, they went right to town. I think that we might should just institute the no pad rule every single morning. By the time I was getting Whitman ready and finding his breakfast, they were asking me to help them with math. I did have to make them wait for a bit until Whitman had left and we had eaten breakfast. Robby went to Conway today to work and I don't think that it was a coincidence that he did this on the same day that the homeschool group came over. It is about 22 extra folks at the house counting all of the mommas so I might could see how he might have a difficult time getting his work done. We zoomed on through our work this morning and soon the house was cleaned and I was heading to pick up Whitman from school. I walked in his class and even though I saw all of the kids, you would have never known that there were 12 children in that room. It was silent. Whitman was actually neatly putting up the blocks-it was almost as if I had stepped into the twilight zone. He was excited to be heading home to play. Sara pulled in the driveway just as I did. The kids all immediately started playing outside and pretty much were outside until almost 12:30. Some would migrate in occasionally for lunch-lunch was slim here since I have no milk or bread, don't even have hot dog or hamburger buns. I do have plenty of tortillas and might still try to make it until we have to do our Thanksgiving shopping. That is possibly, as long as my gallon of orange juice holds out, but once it is gone there will be a mutiny if we don't have any milk. After the kids had played long enough, everyone did their missionary reports. They all did great. I had tried for Whitman to learn the Great Commission but it just wasn't happening so he didn't do anything. He could have cared less though. If I would have had him learn something abut missionaries (They tell people about Jesus. They live...) He could have done it, but the Bible verse was too hard for him. Keaton had only had her report for a few days to practice and she mastered it. I was reading along on another page ready to help but she just needed help on the word Cypress. She is moving through her reading book and is nearing the end, but she just still struggles a bit. Watching her read today though, made me realize that it will all click for her soon. After the reports, we kicked the kids outside and there they stayed despite the sprinkling rain. Really, no one seemed to mind, Whitman hung with the big kids and even played a game of capture the flag. When everyone left, Reagan and Keaton headed home with the Heltz and Caroline stayed here. The afternoon was short but we did have time for the girls to make Campbell's cookie for her snack tomorrow. Then we loaded up and were off to basketball practice. Campbell practiced first followed by the boys. I am very excited about Campbell's coach-he looks patient. After it was all over, we headed home and Robby had supper waiting for us. The kids then had showers and a bit of free time before bed. I worked on my Christmas shopping list some and now have to go and put Whitman back into bed. He fell asleep on the way home from practice. Robby picked him up before it started and slept most of the time that we were gone-this means that he may never sleep tonight. We have been to Yosemite National Park twice, and I have loved it more each time. I plan to some day return and spend a whole week there. Old Faithful Lodge is a place that I think that I might could just live in. We enjoyed it so much that we bought two ornaments. The other one I highlighted in my 2009 Christmas ornament countdown. The first trip there was in 2007 with Grannymom and Grandpa. Anderson was a baby, and the boy slept absolutely none while we were staying in Old Faithful Lodge. I would walk the halls with him. He was probably just off from traveling, but this was also the first time that he had really broken out with excema rashes. Here is the link to the blog from that trip. The next trip was 5 years later in 2012. We had three more kiddos when we returned. This makes me think that maybe I should put getting to Yellowstone high on my list so Whitman can see it. He would love seeing Old Faithful. We were on a road trip but Grannymom and Grandpa met us there. We were not prepared for the 12 inches of snow that fell the day that we slept at Old Faithful Lodge. It made the place even more beautiful. Here are the pictures and blog from that visit. The boys have been into Minecraft lately so they were upstairs in the bonus room reading their Minecraft books and working on the Xbox. I had to wake up the girls and Whitman. The girls wake up much quicker than Whitman, and I had to work at waking Whitman up. Once he is awake, he still doesn't move quickly, and that is what we have to do on school mornings. Robby took Whitman to school while the rest of us started on our breakfast. Afterwards, we did some of our together work. We didn't do all of our memory work but we had plenty of reading to do which I am so enjoying now. The kids may not be enjoying all of our reading, but I sure am. Everyone did the work today without too much fuss. That made this Monday morning a bit easier. Campbell had finished most of her school work yesterday so she was quickly finished. Anderson was finished last and it even took him well into the afternoon. We did more reading at lunch. Though there was quite a commotion when Campbell wanted her panani to cook longer than Graham's sandwich. Gracious me. Once that scuffle was settled, we were able to get back to our reading. As soon as lunch was finished, chores were done and Graham's missionary poster was finished, I left the house. Yes, our missionary reports are due tomorrow so we have indeed waited until the last minute. I am not sure why someone suggested doing posters (I probably did) but goodness. The whole idea of posters has just overwhelmed me. If we would have said 5 page reports for everyone, that would have been completely different and I would have jumped on it-but posters! Eeek! I then met Robby and we switched cars before I picked up Whitman from Nonna and Pops' house. Whitman and I headed to the ENT to check on the continually fluid in his ears. I had taken a slew of books in my bag to read to him but we were barely able to finish one book before we were in the exam room. We had just closed the first book when the doctor came in. One glance at Whitman's ears and the doctor said that there was a tiny bit of fluid in one which was normal. He also said that shows that his Eustachian tubes were doing their job. Also, the fluid that was left in his ears wasn't enough to effect his hearing. Honestly, we had expected his ears to not only have fluid today but also to be infected. I was already trying to figure out exactly when he would be able to get tubes. Thankfully, none of that is needed. We headed back home and I was pleased to find that the house was just as we had left it. Campbell, Keaton and I worked on Graham's snack for Wednesday, snickerdoodles. Around 4, I kicked everyone out and went to town finding things to throw away in this house. I rearranged one shelf in the school room closet trying to move 3 of our crates out of the school room. My efforts were in vain because that shelf could only fit on of the crates and not the 2 like I had expected. I guess we will just have to live with all of the crates in the school room. They are all packed full and it every thing in them is stuff that I use every single school day. I then ventured to the girls' room to work on their shelves. I was able to get a few more things off their shelves. I have already decided that I will work really hard at going through every shelf/drawer/closet after the first of the year. Today, I did suggest to Robby that we take everything out of the house and strategically put it back in. He didn't go for that idea at all. Robby did go outside to play a game of kickball with the kids. When they all came back in, everyone showered and then we had supper. Afterwards, Robby and I worked on supper while the kids read their reports and then picked up a little bit. Before bed, we watched a Shark Tank and then it was bedtime in this house. Well, bedtime for the kids but ice cream time for me! My, my, we sure do hit that snooze on the alarm clock way too many times every day but especially on Sundays. Graham was already awake and dressed (in shorts which I did ask him to change out of) but no one else was stirring when I climbed into the shower. By the time I had finished, Campbell and Keaton were getting ready. Campbell was wearing one of Reagan's shirts and was looking for pants/leggings and Keaton needed help with her pantyhose. I never thought that a child if mine would love wearing pantyhose as much as she does. The kids all sat down to eat breakfast at the bar-I am not sure why they didn't eat when they were playing their ipads but that left them about 9 minutes before we did have to get in the car. We are fortunate however because if our car ever stalls and we need food, there will be enough crumbs in the car to feed our family for days. We made it to church in time to see Nonna and Pops but by the time we made it to Grannymom and Grandpa the music was already starting and it was time to sit down. Whitman ran on to the front row and wanted to sit there but thankfully, he did come back when I gave him the stink eye. Whitman, again, just barely survived during church. I thought about shoving him down towards Robby who was on the other end of the pew and I also thought about hauling him out of there by his arm but we pressed on and both survived. After church, Anderson went with his mission's group to buy stocking stuffers for the kids at the children's home. I do believe that Anderson had lots of fun. He came home telling what all they had bought to put in the stockings. The rest of us had lunch at Grannymom's house. The kids had time to play before we headed home. Robby eventually had to get back out to go and pick up Anderson. I, then, helped Graham with his missionary report-we still have to do his poster tomorrow. Next up, was working with Keaton on one of her Christmas presents and helping Reagan with a birthday present that she is making. We had some time to clean the house a bit before we had supper. Robby worked hard at emptying out the fridge and tonight when Reagan was grabbing her water bottle, she commented that the fridge looked empty. Indeed it did-I may need to go to the grocery store tomorrow. After supper, we watched a Toy Box and a cookie decorating show. It is pretty quiet up there now so hopefully everyone will sleep well and Whitman will stay in his bed tonight. He didn't come down last night even though I had made a pallet for him. After the shopping, they came back to the Nonna's house for lunch. Keaton ate quite a bit of mandarin oranges and hopefully, that is the reason that she soon became sick. Poor Nonna and Pops-Keaton didn't even make it to the bathroom at their house. She usually always does here but not there. Near Russellville, Reagan and Anderson woke up at their preteen retreat. It sounded like they had lots of fun. Reagan roomed with all of her buddies and Anderson and a few other boys were in the room with all of the men (perfect spot to be thinks this momma.) They had breakfast, had their quiet time, had free time and had at least 2 different sessions with the leader and in their small groups. Our first stop was to drop off our cake entry at the Thompson library. Campbell and Graham were pretty pleased with their cake and the librarians asked them all kinds of questions as we delivered the first entry. The next stop was at Williams Sonoma for a cooking class for them. The lady that led the class was really good and made mashed potatoes, gravy and stuffing. Graham really liked the gravy but Campbell didn't try any. There were just 4 kids in the class and the other family was a homeschooling, CBS going, large family from Benton-small world. Afterwards, we walked around the store for a bit, and Graham and I left with some apple cider. I always forget how much I like that store and how expensive it is. I do like to browse there though. Then we met Robby and Whitman and hopped into their car. We headed across the river to the USS Razorback. They were finishing their Veteran's Day ceremony, and we arrived just in time to stand in the line for lunch. They had hot dogs, hamburgers and chicken. We found some chairs on the deck in the sun and ate. Then we joined the line to go through the submarine. They asked for everyone to be 5 to do the sub and thankfully, no one asked Whitman's age. We weren't too worried about all of this until we moved up to the entrance and saw the 14 (or so) foot ladder that he had to go down. I went down first with him right above me. He was a bit skittish saying that he couldn't do it. But he was saying that as he climbed on down the ladder step by step and soon made it. There were lots of folks down in the sub so we just shuffled through each room. Guides were there to tell you about the sub and Whitman and Graham asked questions about things. It was all very interesting, but I do know that submarine life isn't for me. Afterwards, Robby took us back to our car and we used our Dairy Queen Blizzard coupons for the week. Since we had Whitman and he has never eaten anything from Dairy Queen since our first visit, we tried something new with him. If you remember, he was upset that they just didn't get him M&Ms and instead mixed the M&Ms with ice cream. Robby asked if they could just give him the vanilla ice cream with the M&Ms on the side. Well, he absolutely loved that. I am glad that he can enjoy the Blizzards now but that means there is one less-no more Blizzards for Robby and me! I was then headed to pick up Keaton when we got the call that she was sick. Whitman and Robby were the ones headed home so they picked her up. Graham, Campbell and I went to the Dollar Store to pick up a treat for them and then we drove on to the library for the cake tasting. On the way, I received a call from the library saying that they had won 3rd place. I tried not to sound too excited so they would be able to find out once we arrived but they knew something was up. I told them that they had indeed won 3rd and they were so excited. When we came in, one librarian recognized them from earlier and gave them their prize-a 20 dollar Kroger card and something pass to Crystal Bridges. Then we went in to taste the cakes. There were a total of 8 entries-the winner was a cherry cake. We tired our cake, of course. It was pretty good. I thought that I would really like the filling inside of the cake but it was not my favorite at all and the icing, what I was worried about, was very good. Graham tried another cake but he did not like it at all. I think that he had already picked out his favorite-his! The boy was so excited to win and said that he didn't think that would make it to the podium. Seriously, he was more excited than Campbell. On the way home, we called Pops and Grannymom to tell them about our win. Keaton was already home and sound asleep on the couch. Whitman was watching a movie in our room. Campbell and Graham soon headed outside to play with the neighbors. Keaton was pretty pitiful for a while this afternoon. I was even worried about driving her to go and pick up the retreaters. Robby, Campbell and Graham had already left to go and eat out tonight (mystery shop). I am glad though that Keaton did well and by the time we made it to church, she was talking away. The buses were already there and the kids were unloading. We helped a tiny bit and then came home with my crew. Anderson and Reagan had their showers while Whitman and Keaton ate. She was feeling better since she had half of a baked potato along with a slice of cheese. She asked for a waffle too but we were out. I read to her and Whitman as they ate. Then Anderson and Reagan joined us to eat their supper. Soon Campbell and Graham were home with Robby. They had their showers and then I played a game with the little girls and Whitman. Afterwards, Keaton passed out her cookies that she had made at Nonna's house. We had a bit of downtime tonight-I have lots of things to do on my weekend to-do list but I don't think any of that is going to happen tonight. I think that we might just send the kids to bed early tonight but it is super quiet in the house right now-Keaton and Anderson playing their ipads, Graham is watching football, Reagan and Whitman are watching a movie and Campbell is reading every single word that I type. If things stay quite, they might even get to stay up later!